Bring the Rain was one of those rare contemporary romances that pulled at my heartstrings. I couldn’t help but fall in love with Lizzy Charles’ main characters, Autumn and Colt! From the beginning, it was easy to figure out how emotionally wary and detached Autumn was from her father. She always seemed to keep him at an arm’s length when it came to how close she would get to him. At first, it was a little puzzling why she acted that way towards him, but as the pieces started coming together little by little, it was understandable what she blamed him for; abandoning her at such a young age when she needed him most and giving up on their family so easily. Now a teenager, Autumn had to learn the truths and overcome them at a slow pace, as well as learning to trust in her own heart instead of what she thought she wanted. I couldn’t get attached to Autumn right away as a character, but as she faced feelings that were hard to confront, she started to grow emotionally stronger in her own way. Instead of acting like the snobby girl who moved away to New York at nine years old, she became the sixteen-year-old girl who admitted her faults and appreciated simple living with her dad. The girl that lost herself at nine years old grew up and matured in each and every chapter, and I was thankful that Lizzy could showcase that so well. When Colt appeared in the story, I didn’t really know what to think about him. I thought his first appearance was very comical, especially with the way he approached Autumn, but I still had to learn a lot about him. For a while, I fell for him being the “perfect” guy Autumn thought he was, but as the chapters passed, I began to question if even the nicest guys could really be perfect. My gut instinct proved to be right when a plot twist I never saw coming appeared out of nowhere, and I instantly felt my admiration for him dissipate. Even when Colt proved to be a very kind and honest guy, he had his moment where he was also keeping secrets and not being so nice. I think at first I wished Autumn had confronted him more for those answers she sought, but now I realize that the distance she put between them was for the best. It momentarily gave her a new perspective and allowed her to mature in a different way. For the first time, Autumn admitted that she was at fault too and accepted that even someone like Colt could have a history of his own mistakes. This growth they dealt with while being apart ultimately brought them closer together at the end, and gave them a chance to learn from assuming the best from each other right away. I think Lizzy did a fantastic job of pacing the story well. There weren’t any moments that I felt were hindering the story or speeding it up unnecessarily. The plot twists could sometimes be predictable, but there was one that caught me totally off guard and it kept my interest up for the remainder of the story. I admired how Lizzy could create such different personalities and voices for her characters, even the ones I didn’t like at all, and I could picture every moment vividly in my mind. One of the secondary characters I just couldn’t like from the start was Autumn’s supposedly best friend, Gina. She had a huge personality, but she also had this dark and crazy side to her that bothered me so much. There was also a moment where she betrayed Autumn’s trust I would have found hard to overcome and forgive her for. Autumn’s mother was also another character I found myself disliking. The way she treated her daughter as if she were a minor responsibility in her life made her seem careless. Thankfully Autumn didn’t grow up too bad and stayed on a good path. Overall, Bring the Rain by Lizzy Charles was an enjoyable read, providing a unique and fresh setting to the story and differentiating it from other YA contemporary romances out there. The characters were able to convey emotions that drew the reader in from page one and also allowed readers to view their quest to maturity and forgiveness. I was glad at how Lizzy ended this story, leaving none of my questions unanswered. I was able to cheer for her characters almost from the start, and now they hold a special place in my heart. I definitely look forward to future stories by Lizzy Charles and can’t wait to see what she’s up to next! 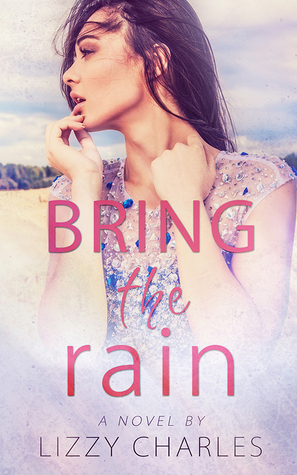 Totally recommend Bring the Rain to fans of contemporary romances! I just read Lizzy's Effortless With You series and loved it. This sounds really good, too. Great review!